* WHO Can Save? WHAT can Save? * (Ref. to hand illustration above) Which ones do we emphasize? (We don’t ignore any! Emphasize some over others). ALL IMPORTANT – LACK OF BALANCE LEADS TO PROBLEMS – LACK OF U/STAND/ HOW EACH APPLIES/FITS TOGETHER AND WORKS. * IMPORTANT how we look at the Word. (I look at the Word as a DISCIPLE (learner). * I don’t need u/stand Greek to u/stand GRACE! 2.) Religious neighbors strong on GENERALITIES (Love, Joy, Peace, Bro. covers sin, and provides a confidence of being heaven bound. HOW THIS ALL FITS TOGETHER. 4.) How – appreciate GRACE if never see how sinful we are? the world through him” (John 3:17). 8.) Gospel IS NOT A WHIP it is a LIFE LINE! violations (law/works)/ on the other there is nothing (Grace/faith)). GOD (“G” above cross) RIGHTEOUS IN JUSTIFYING LOST MANKIND. JUST/RIGHTEOUS IN SAVING ‘JACK’ (Draw stick figure). 4.) (Point to the cross) YES IT IS! He paid for it ALL. 5.) Isaiah 53:11 “SATISFIED” (Draw line from God to Jack) Now I can save Jack! 7.) Question: IS THE SACRIFICE GOOD ENOUGH TO DO THE JOB? a.) God/Jesus/HS DID NOT QUIT! c.) Don’t mean to disappoint you… I AM A SINNER/FAULTS/HUMAN. 3.) Word of God doesn’t change…. But IT IS MEAN TO CHANGE ME! 3.) Want to GROW? Grow in grace! ‘BECOME’ IN GRACE WHAT GOD WANTS! 2.) CREDITED TO ABRAHAM’S ACCOUNT… no merit at ALL. 3.) God destroys the PUNISHMENT OF SIN. PRINCIPLE WHICH GOVERNS OUR LIFE – GRACE!!! ON MY PART! GOD DOES THE WORK! b.) I used to preach (Ruler) 40% me and 60% God! NOW 100% GRACE. people) THIS IS LAW/WORKS IN ACTION!!! and more that is on list, but now she does it out of love… not fear! heaven or because you’re going to heaven? PRAY/SING /GIVE… BECAUSE IT IS GOD’S NATURE IN ME. 3.) Galatians 2:20 NO LONGER I THAT LIVE…. 4.) I DON’T HAVE TO/ I WANT TO!!! Salvation is offered to one and all…. No questions asked…. R/Be Baptized…. Saved or just COME HOME. * HOW HIGH DO YOU RANK ‘SECURITY’ in your life? WELL/CONSISTENTLY YOU PERFORM OR ON SOMETHING ELSE? * What about in Christ/relationship with God (VERTICAL)- Do you FEEL secure? – What is this security based on? PERFORMANCE OR GRACE? * What about within the body of Christ (HORIZONTAL)- Do you FEEL Secure? * Which do you FEEL more secure in: VERTICAL OR HORIZONTAL? * What is it about GRACE that make one FEEL more secure than PERFORMANCE? * Describe SECURITY of Christian in terms of a FAMILY WITH CHILDREN. * Why do you think dad put “FALLING FROM GRACE” as his next lesson? beings feel! This is why we are studying, “GRACE, GOD’S POWER TO BE(COME)”. look at later if you wish. BEINGDELIVERED FROM AND BEING MADE DEAD TO THE LAW. D. NOT human reformation/determination- IT IS DIVINE REGENERATION. people’) disciples = A C C E P T E D. 3.) What does ‘ACCEPTED’ mean in this context? 4.) Which is more saved/accepted – the beginner or the mature Christian? 1.) Growing, learning, maturing, heaven bound!!! A. Once saved always (no matter what) saved. B. How secure do you FEEL with others in the body of Christ? the‘one in spirit’ stand we should have? Here is a survey. It’s not a test. I’m not going to grade this. I just want to see how much disagreement we have over some pretty basic things.Mark the correct interpretation of the quoted passages? You may only mark one answer per question, and you must choose one. 1. (2 Cor 13:12) Greet one another with a holy kiss. a. Says what it means; means what it says. b. No longer applies today at all. c. Applies today but only the underlying principle (greet one another warmly) applies. 2. (Rom 1:27) In the same way the men also abandoned natural relations with women and were inflamed with lust for one another. Men committed indecent acts with other men, and received in themselves the due penalty for their perversion. 3. (Mat 5:29) If your right eye causes you to sin, gouge it out and throw it away. It is better for you to lose one part of your body than for your whole body to be thrown into hell. c. Applies today but only the underlying principle (lust is a deadly sin) applies. 5. (Mat 5:22) But I tell you that anyone who is angry with his brother will be subject to judgment. Again, anyone who says to his brother, ‘Raca,’ is answerable to the Sanhedrin. But anyone who says, ‘You fool!’ will be in danger of the fire of hell. c. Applies today but only the underlying principle (any name calling that dehumanizes is wrong) applies. 6. (Mat 5:10-12) Blessed are those who are persecuted because of righteousness, for theirs is the kingdom of heaven. 11 “Blessed are you when people insult you, persecute you and falsely say all kinds of evil against you because of me. 12 Rejoice and be glad, because great is your reward in heaven, for in the same way they persecuted the prophets who were before you. 7. (Mat 5:39) But I tell you, Do not resist an evil person. If someone strikes you on the right cheek, turn to him the other also. c. Applies today but only the underlying principle (do not seek revenge over a point of honor) applies. 8. (Lev 27:30) “‘A tithe of everything from the land, whether grain from the soil or fruit from the trees, belongs to the LORD; it is holy to the LORD. c. Applies today but only the underlying principle (give generously to good works, especially your church) applies. 9. (Exo 20:9-10) Six days you shall labor and do all your work, 10 but the seventh day is a Sabbath to the LORD your God. On it you shall not do any work, neither you, nor your son or daughter, nor your manservant or maidservant, nor your animals, nor the alien within your gates. c. Applies today but only the underlying principle (Sunday is the Christian Sabbath) applies. 10. (Num 18:29) You must present as the Lord’s portion the best and holiest part of everything given to you. c. Applies today but only the underlying principle (wear our best to church) applies. 11. (1 Cor 14:34-35) women should remain silent in the churches. They are not allowed to speak, but must be in submission, as the Law says. 35 If they want to inquire about something, they should ask their own husbands at home; for it is disgraceful for a woman to speak in the church. 12. (1 Cor 11:6) If a woman does not cover her head, she should have her hair cut off; and if it is a disgrace for a woman to have her hair cut or shaved off, she should cover her head. c. Applies today but only the underlying principle (women should wear fashionable hats to church) applies. 13. (1 Cor 11:7) A man ought not to cover his head, since he is the image and glory of God; but the woman is the glory of man. 14. (1 Cor 16:1-3) Now about the collection for God’s people: Do what I told the Galatian churches to do. 2 On the first day of every week, each one of you should set aside a sum of money in keeping with his income, saving it up, so that when I come no collections will have to be made. 3 Then, when I arrive, I will give letters of introduction to the men you approve and send them with your gift to Jerusalem. c. Applies today but only the underlying principle (we should give weekly at church) applies. What is Bible baptism for? The short answer… Baptism (immersion) is “for the remission of sins”. Sounds pretty straight forward, right? Yet many sincere people have misunderstood it. Perhaps you have heard or read some who said baptism is not what Peter said it was for in Acts 2:38, ie “for the remission of sins”. A good principle is ‘THE PLAINEST THING IS THE MAINEST THING.” This should not be hard to understand. Just read Acts 2, and the picture is clear on this subject. There are many other passages of course on the subject of salvation. Not all truth is contained in one passage. There are verses on FAITH (John 3:16), REPENTANCE (Luke 13:3-5), CONFESSION (Romans 10:9-10), as well as BAPTISM (Mark 16:16) and the gift of the Spirit (Acts 2:39). All are important to the process of being saved, and being sealed as one of His children. You cannot separate any of them from the ‘plan of God’. Yet each have a different reason for ‘being there’… Some passages do not mention all these things. Context determines why. Having said this, which is all too obvious when one reads the ‘salvation accounts’ scattered throughout Acts… there is more to the study. Jesus Himself, refers to it, but not just to the water aspect of it. He knew very well, that ‘just water’ is, well, just water. When he spoke of ‘grape juice’ and bread (Matthew 26) He made some very special connections in referring to these as his blood and body. More than just grape juice and bread… It involved ‘remembering’, ‘examining’, ‘communion’. It also speaks of relationships, both ‘vertical’ and ‘horizontal’ for the Christian. 8 The wind blows wherever it pleases. You hear its sound, but you cannot tell where it comes from or where it is going. So it is with everyone born of the Spirit.” (John 3:3-8). Here Jesus himself says water and Spirit are involved in this marvelous new birth. I believe the “Spirit” mentioned here refers to the Holy Spirit (Greek ‘pneumatos’ which can mean ‘wind’, ‘spirit’ or Spirit’). I do not believe translators made a mistake in capitalizing “Spirit” here. My opinion is that it means what the context demands….the HOLY SPIRIT, and according to the text it is Jesus who ‘baptizes’ or gives the Holy Spirit (that’s what John says). There is no contradiction with Paul saying there is ONE BAPTISM (Ephesians 4:3-5), because there is only one. It is simply composed of TWO ELEMENTS…. ‘water’ for the remission of sins (which is a command …Acts 2:38) and the ‘Spirit’ (a promise mentioned in Acts 2:39) done/given by Jesus. Without the Holy Spirit’s involvement, it would be confusing indeed since in Titus, it says, “But when the kindness and love of God our Savior appeared, 5 he saved us, not because of righteous things we had done, but because of his mercy. He saved us through the washing of rebirth and renewal by the Holy Spirit, 6 whom he poured out on us generously through Jesus Christ our Savior, 7 so that, having been justified by his grace, we might become heirs having the hope of eternal life. (Titus 2:4-7). Here we have terms “washing of rebirth” (immersion in water) and “renewal by the Holy Spirit” (which takes place when one is immersed in water)… When the Holy Spirit was “poured out” on Pentecost…the apostles are given ‘power from on high’ as promised (Acts 1:4) and they were empowered to speak in other languages and perform miracles. The Holy Spirit however, is for all who submit to Jesus and by faith repent and are immersed into Christ. Luke records, ” John answered them all, “I baptize you with water. But one who is more powerful than I will come, the straps of whose sandals I am not worthy to untie. He will baptize you with the Holy Spirit and fire.” (Luke 3:16ff). Context reveals that the “fire” was to burn up the ‘chaff’ (contextually referring to the unbelieving Jews (not just a few), and refers to the AD70 event, and can indeed refer also to the final judgment of hell fire for all who reject Jesus… The Holy Spirit in this text refers to what Jesus Christ gives to the ‘wheat’. I believe this happens when one is born again. The ‘wheat’ mentioned in Luke 3:16ff refer to those who are being added to the church. This began on the day of Pentecost. This is the gift of the Spirit promised in Acts 2:39, and this differs from receiving gifts FROM the Spirit (speaking in different languages, miraculous powers etc…) Again, the powers which the Apostles received were special and limited, but the ‘baptism’, ‘outpouring’, ‘gift’ (all referring to the same thing) of the Holy Spirit is the gives one ‘new life’ in Christ. We are commanded to be immersed (in water). We are not commanded to be immersed in (receive) the Spirit….we are just promised that the Spirit would be given to all Christians. My understanding of scriptures is that when we are baptized in water for the remission of sins, we receive the Spirit of God in our lives (in that order)…. we come up out of the water a ‘spirit-being’, alive, and a “new creation” (2 Corinthians 5:17), “partakers of the divine nature” (2 Peter 1:4ff). Without the Spirit…. we do not belong to Him (Romans 8), are not sealed (Ephesians 1). It is simply true, that a ‘waterless Spirit baptism is as powerless as a Spiritless water baptism’. Jesus said “Very truly I tell you, no one can enter the kingdom of God unless they are born of water and the Spirit. (John 3:5). One can take any truth, and push it to an extreme and make it false, or contradict other passages. Considering the various passages, and their contexts, makes it plain to me… ‘renewal of the Spirit whom He poured out on us’, is what happens when one is immersed for the remission of sins. Note: We need to quit worrying about “eis” (“in”) when studying with those who insist on “salvation before immersion” and start pointing out that if salvation is received before immersion (which is not so), then we miss the NEW BIRTH OF WATER AND SPIRIT spoken of by our Lord Himself in John 3 as well as what John spoke of in Lk. 3:16f. To study more about what I believe regarding the gifts FROM OR GIVEN BY THE SPIRIT, you can look at the articles written which deal with this. To me there is a huge difference between the gift OF and gifts FROM the Spirit. One does not receive the Spirit as a GIFT, A SIGN OF SONSHIP OR BELONGING TO GOD THROUGH JESUS before being immersed INTO CHRIST, nor does one receive the SPIRIT long after being immersed BY PRAYING AND PRAYING ‘through’. Nor does the indwelling of the Spirit mean one receives the miraculous powers given the apostles. 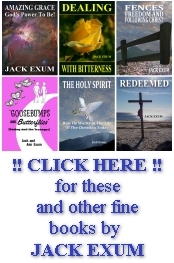 The Spirit of God is given (now available) for any who by faith repent of their sins, and when they are immersed into Christ for the remission of sins…. and are RAISED UP A NEW CREATION. Yes dad shot the can. Years ago when I was so young. Two would-be-hunters. No ‘luck’… not even a Kill-Dee was seen. Yet years later… reflection. Just sitting here… thinking about that old can. I think it was an apple juice can… maybe tomato juice… who cares, right? Yet back then and throughout a ministry, it meant so much more. Now… it still intrigues me. Maybe you have shot a can before… maybe a bottle… but did you stop and think what lessons could be learned? 1. Watch what you shoot at! If you mean to hit a can… hit it! Soul winning is a very special work. It’s almost like open heart surgery. It’s not about winning a battle or proving someone right and going out bragging on how great you did. It is wholly about caring enough to share the word of God in a way that is gently firm. Almost like…. well it’s hard to say what it is like. But just imagine yourself on the other side. Every ‘stroke’ of the spiritual ‘knife’, just think… don’t be in a hurry… sometimes it means simply taking more time… more patience… more prayer for sure… Try again…. find the real problem why a person is holding back, and apporach it from the “needs” angle. Shot-gun approaches tend to hit (damage) things not really important. You don’t have to deal with “instrumental music” (whatever your position), to bring one to Christ. 2. Make as little damage as you can in this process… I know this is related to the previous thing. But of course when trying to win a soul, you have to (with the Word) and wisdom, remove a ‘problem’. How it is done is as important as the ‘doing’ of it. One man who had attended many services and heard many sermons… finally he obeyed the gospel and was truly happy. When asked why he waited so long, he replied, “Well, other preachers got up and taught pretty much the same thing as this preacher did. The big difference was this man was truly sorry I was lost…. and the others seemed like they were glad.” Somehow, there is more involved here than just teaching truth…. it involves CARING FOR THE LOST. This simpy cannot be hidden. Cannot be faked. 3. Be careful of a ‘one shot’ approach, which may shut the door for others to approach this person. Be a door opener, an interest creator, a bridge builder…. This doesn’t mean compromise truth by any means. It means speak truth in love for sure, but if you know you are never going to see this person again…. try to do something, say something which doesn’t close the door of the lost person’s heart for others who may ‘bump into’ this person and have an opportunity to spend more time in teaching. Remember even though you may plant, someone else waters, and God gives the increase… So what if you don’t get the credit (here)…. This is a growing article. Just wondering if you wanted to participate? If you have some ideas, feel free to share… What do you learn from the ‘can’? Brethren, with all the discussion on issues like “Divorce and Remarriage” going on, and the much needed efforts to help brethren avoid the break up of homes, ‘stay in the struggle’, and work through family issues…. it seems we are not placing the same, much needed emphasis on how to avoid DIVISION. We are told by Paul, “I …… BESEECH (implore/beg) you to walk worthy of the calling with which you are called, with all LOWLINESS AND GENTLENESS, WITH LONGSUFFERING, BEARING WITH ONE ANOTHER IN LOVE, ENDEAVORING TO KEEP THE UNITY OF THE SPIRIT IN THE BOND OF PEACE….” (Ephesians 4:1-3). Brethren, if there was ever a TIME when we need to follow this… it is now!!! Staying in the struggle, working through problems, loving each other ‘above the fault level’, refusing to be a part of any call to divide… and marking those who call for such. Refusing to listen to those who simply seem to be adding fuel to the fires instead of trying to help brethren put out the fires. We just have too much at stake to ‘give up’ and ‘divorce’ (divide). Thanks to Gerald Wright and his memory of dad… Hopefully it will help others. I will be putting dad’s thoughts on “Brotherhood and Love” here as well…. 2. How is grace applied/lived out? Look at Jesus! 4. Today we study HOW JESUS = OUR GRACE. 2.) Beauty of Grace = seen in Jesus – W/o Jesus we wouldn’t u/stand grace. 3.) “Grace” = Noun/ Jesus makes it a VERB – ACTION! 3.) Disciples not meant to be ISOLATED/CUT OFF FROM LIFE – INVOLVED…. JESUS/ HE IS IN US…. GIVE…. * Is the church a denomination? Of course not! Yet the church divides. * BIG TASK = GOING DEEPER/ BROADEN OUR UNDERSTANDING NT CONCEPTS. * (J.W. Debate) Dad conducted a small debate with a Jehovah Witness when he was a young minister. The debate was over, IDENTITY OF THE N.T. CHURCH. Dad began: “AD 33, Jerusalem, Pentecost, Acts 2:38, Organization, Worship… all explained with scriptures to back up each point. Then his opponent began… The NT Church is a PRAYING CHURCH, A LOVING CHURCH, A SOUL WINNING CHURCH, A UNITED CHURCH…all with scriptures to back up each statement. * Need to re-examine our approach… What dad said was not wrong… but he recognized that something was missing. * What a/GRACE? Ephesians 2:4-10 Read NEED TO GROW /BROADEN OUR U/STANDING/ MARVELOUS CONCEPT “God’s power to GROW”. * Not small grace (Romans 5:8-10) It’s a ‘much more’ grace! FORGIVEN, SEALED AND HEAVEN BOUND…. *** THIS MAKES ALL THE OTHER THINGS IMPORTANT! the ‘end result’ of relationship with God thru Jesus. 3.) Law and prophets hang on this one. the faith…the power is in the OBJECT of faith which is vital. B. “I belong to Christ” THEREFORE…. E. I John 1:7 “Fellowship” w/each other. Conclusion: Yes, grace is all about being saved and remaining saved…. We will learn more about this in the weeks coming. Yet it is also about the horizontal (people) relationships we as God’s children have. I Corinthians 12:12-27 The hand does not hate the foot. The eyes are not jealous of the toes. WE ARE MEMBERS ONE OF ANOTHER.